We no longer run, screaming, for the hills when a company launches a smartphone with a screen in excess of 5-inches, and it's a good thing as phablets have become a mainstay in the market. Two of the most recent heavy hitters have arrived in the past month, with the Samsung Galaxy S6 Edge+ being joined recently by the Sony Xperia Z5 Premium. Both boast super-sized displays, eye-popping resolution and a whole heap of power, but which one takes your fancy? Read on to find out as we put these goliaths head to head. We're changing up the formula or our versus piece here and jumping straight in with our screen comparison, and when you see the specs you'll understand why. Samsung wowed us earlier this year with the Galaxy S6 Edge and its sweeping, curved display making it look like a phone from the future. It then expanded that thinking with the Galaxy S6 Edge+, giving us those beautiful dual curved screens on a 5.7-inch display. Add to that Samsung's excellent Super AMOLED technology, which really does make it pop, and a QHD resolution of 1440 x 2560 it's difficult to see how it can be bested. Enter then, the Sony Xperia Z5 Premium. It's the big brother to Sony's new Xperia Z5 flagship, but with an enticing twist. While the Z5 has a 5.2-inch, full HD panel the Z5 Premium kicks things into overdrive. At 5.5 inches the screen on the Z5 Premium is a touch smaller than the S6 Edge+, but its 4K resolution makes it the first smartphone in the world to rock the 3840 x 2160 stats. That gives you an incredible pixel density of 806ppi, which easily tops an already impressive 518ppi on the Galaxy S6 Edge+. The Xperia Z5 will be arrow sharp, while the S6 Edge+ will likely be brighter and more colourful. Either way, these are two of the best smartphone screens around. The clue's in the name of the Samsung Galaxy S6 Edge+ which looks like - yep, you've guessed it - a bigger Galaxy S6 Edge. Samsung's new metal/glass design language and the delicately sloping screen ensures a premium look and feel for the handset, although there's not a lot of grip which can make grappling with this beast a bit tricky. You might want to invest in a bumper or case. It may be slender at just 6.9mm thick and surprisingly lightweight for a phone of its size at 153g, but the 154.4 x 75.8mm height and width means the S6 Edge+ will be a noticeable force in your hand and pocket. Meanwhile Sony is sticking with its Omnibalance design, with a familiar industrial look returning with the Xperia Z5 Premium. The is a notable change however, with the distinctive oversize circular home button on the side getting replaced with an oval, flag key. Why the change? It's due to the inclusion of a fingerprint scanner, allowing you to unlock the the Z5 Premium with your digit. The S6 Edge+ also has one of these hidden under the home button below the screen. Not to be outdone in the dimension war the Z5 Premium is a relatively svelte 7.8mm, but considering it has a smaller screen than the Samsung it sports the same 154.4 x 75.8mm dimensions. It's also heavier at 180g, but the trade-off is worth it for the dust-tight and waterproof finish. Samsung has packed the S6 Edge+ full of power with its own octa-core Exynos 7420 processor and a hearty 4GB of RAM. That means it'll be able to handle pretty much anything you throw at it with ease. In terms of internal storage you can pick from 32GB or 64GB, but remember there's no microSD slot so you won't be able to expand on the space. The Sony Xperia Z5 Premium packs the temperamental Snapdragon 810 processor which has reportedly been overheating in some HTC One M9 and Sony Xperia Z3+ handsets. Fingers crossed it's more stable here. Backing up that octa-core chip is 3GB of RAM, and together that provides more than enough power, while the microSD flap allows you to build on the 32GB of storage by a whopping 200GB. Both handsets come running Android 5.1 Lollipop, the latest release from Google, ensuring you get top notch software. Expect both to get updates to Android Marshmallow once it launches, although it'll take a few months before it's pushed out. The Samsung Galaxy S6 Edge+ sports the firm's TouchWiz interface which has been greatly refined in 2016 making it more pleasing to use than previous iterations. Samsung has done away with a lot of the bloatware and smartened up menu screens making the S6 Edge+ easier to use. 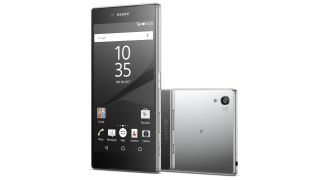 Sony has applied its own skin to the Xperia Z5 Premium with a finish which is closer to that of Google's stock Android. There are a few handy additional features, but for those moving from other Android handsets the Sony should be the easier to learn. You'll find some strong photography pedigree on these two larger than life smartphones. The Sony Xperia Z5 Premium packs a 23MP Exmor RS rear facing sensor which sits flush to the rear of the phone. It's a wide-angle lens with HDR, SteadyShot, SuperiorAuto and the ability to record 4K videos - which you can then watch back at full resolution on its 4K display! Round the front you'll find a 5MP snapper, again an Exmor R lens from Sony's camera department, which can record 1080p video and a wide-angle lens so you can fit more mates in your selfies. The 16MP offering on the Galaxy S6 Edge+ may not look like it's in the same league on paper, but this is the same unit that was in the Galaxy S6 and it's a corker. There's another 5MP selfie cam on the front, so video chats and selfies should look splendid. With such big screens there is a fear for battery life in the two phablets. Neither have removable power packs, so you'll be relying on the battery inside to at least see out a full day before requiring a re-charge. The Samsung Galaxy S6 Edge+ comes with a 3000mAh battery. It's not the largest around but it's acceptable and the addition of wireless charging means it's easier to top up. It also has fast charging, allowing you to get a slug of charge after just a few minutes. There's a bigger 3430mAh battery in the Sony Xperia Z5 Premium, but it's having to power a 4K display which will be very hungry. There's no wireless charging, but there is a Stamina mode to help you eke the last drops from it when you're running low. There's no doubt about it, both the Samsung Galaxy S6 Edge+ and Sony Xperia Z5 Premium are packed full of features. The screens are stunning, the power plentiful and the cameras cracking. If you're on the hunt for a new phablet in your life then these two definitely need to be considered. They're not cheap, but you're getting an awful lot of bang for your buck.